Now this is how you are supposed to say I like golden animation. This is how all cards should be, strong but not strong enough to be considered op. Defnitely no! He's the only reason these miracle-like decks kinf of works now! With Shredder gone, this guy might wreak havoc in Standard! Just pray hat Blizzard doesn't releases another unbalanced Dr. 4! Leeroy doesn't care about Miracle Rogue, Leeroy already have Rexxar for husband. This card can be insane in an Miracle Rogue. I watched Dog (HS player and streamer) in an unbelievable Win Streak using this card (from 8th best player in NA to 5th best player). Combine this card with Gadgetzan Auctionner + Conceal= you draw all your cards and Rogue will have all the answers that she needs. Miracle Rogue is back in full force. Very Dreadful to play against. This is a damn good card in any Oil/Miracle variant. The Coins make so many more plays possible in the mid-late game. a 5/4 for 3 mana seems pretty good... Why are people acting like this is so bad? In what deck? Still a Rogue card, still won't see much play. It brought miracle rogue back. 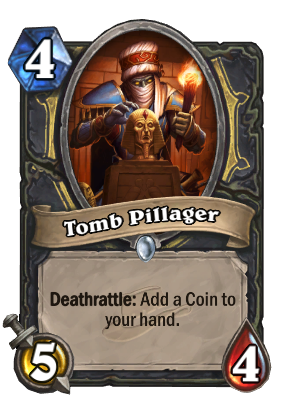 A 4/5 would actually make it harder to kill when you want to use the deathrattle to curve in a 6/7 drop with the coin he provides. 4/5 survives the opposing Shredder; 5/4 trades and gives you the coin. I hope it finds its place now. Okay, rogue isn't the best class but you can't say a card is bad just because it's for rogues. Only three people brought rogue to blizzcon and they were Ostkaka, Hotform, and Thijs. They placed #1, #2, and #5-8 respectively. Blizzard has given rogue more good cards and opportunities to make rogue better and you're just saying it's bad because it's for rogue. As a rogue player, this is easily my favorite card in the set. With Unearthed Raptor, this card ALONE is to me what makes Anub'arak make SO much more sense w/ his high cost. With access to coins, we are able to get him out just abit faster now. OR store it after turn 9 to put him out for cheaper as well. 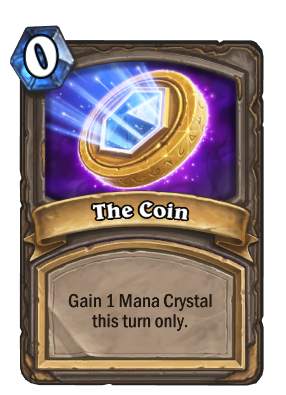 Coin in rogue has always been strong, and with this card, unearthed, and my other fav Rogue card who doesn't see much play sadly (Cutpurse), it only becomes that much stronger. EDIT: Also turn 3 coining into Tomb Pillager isn't a bad play in my opinion. If anything, you force opponent to burn resources into him and then you recycle said coin back into your hand :) Playing either him or Shredder to me is not a bad play. I almost look at him like a slightly stronger (stat wise anyway) class Shredder.